It’s always so fun to go browsing through an antique mall. There’s one near my house that I occasionally get to visit and last week I treated myself to an outing. I found several interesting odds and ends and when I got home I was inspired to make this necklace from an old change purse, several broken old necklaces, a vintage glass button, and some rusty keys. Every element came from that trip to the store, except the wire to put it together. On a brass tag, I stamped the words, “remember when.” Inside the purse, I decided to add a little more history. It contains a 1941 wheat penny, a 1 1/2 cent postage stamp, bits of an old post card, two WWII food ration stamps, and an old photo of an anonymous couple. One could make up one’s own story to go along with the contents or put in personal mementos. 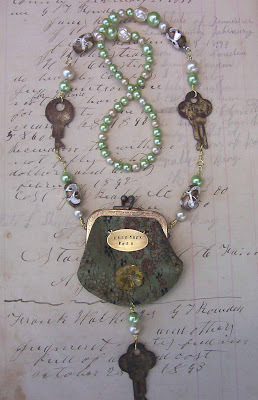 Another inspiration for me is Nina Bagley’s jewelry. I will be taking it to this month’s sale at Silo Studio on Thursday.